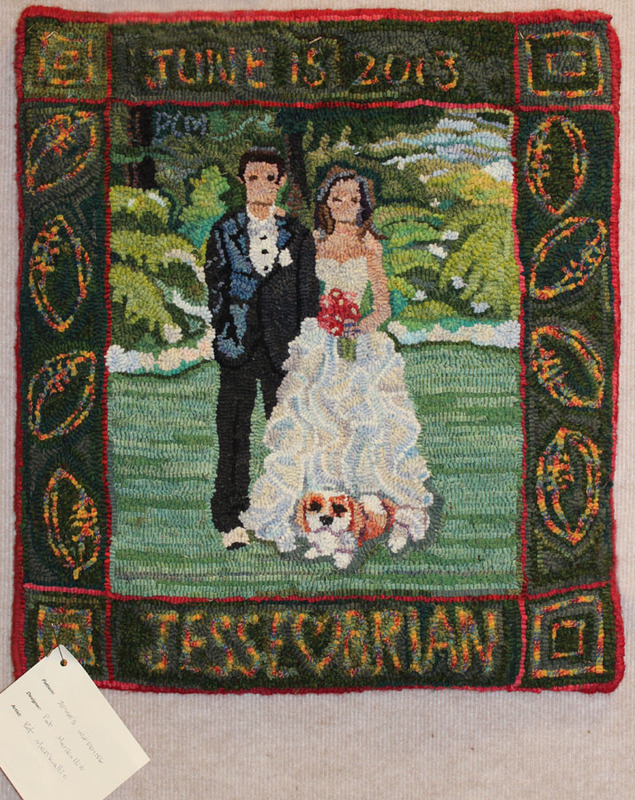 Pat started this wedding rug last November, up at Little River Inn Rug Camp! It was a fun wedding; Pat showed us a video on her i-pad. Her niece, the bride, was wearing a beautiful dress with multiple layers and multiple colours of white! The little pup dog was part of the wedding party. So good to see this rug before it was given to the bride and groom! Thanks Pat, I wanted to see how that dress came out. Sarah’s started the yellowtail on the left at Little River Inn Rug Camp last November; and has done 2 more. I know she really enjoyed this project. She talked about taking Susan Feller’s advice and sewed on some of the leaves. Brigitta and I attended a wonderful art show at the new DeYoung Museum in San Francisco of David Hockney’s work. Brigitta really got it! Her ‘Modern Leaves’ have some kind of magic going on with the colour of the leaves against the colour of the backgrounds. You can take her class at ATHA Biennial 2015 and find out what it’s all about! I love the sea shell outlines on Michele’s ‘Water Mandala’! 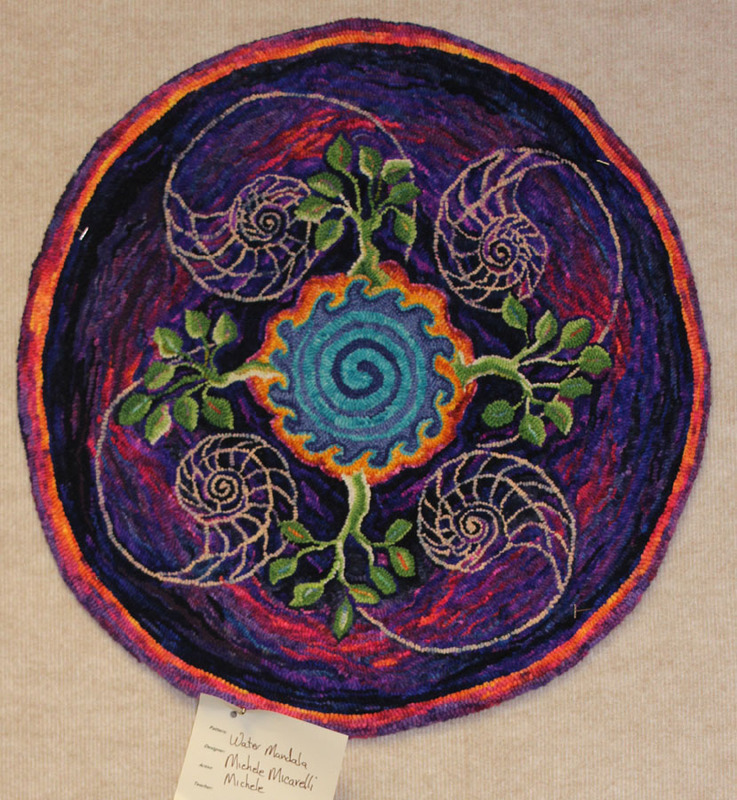 Vivid colours blend out to the edges, while the spiral in the center draws you in. 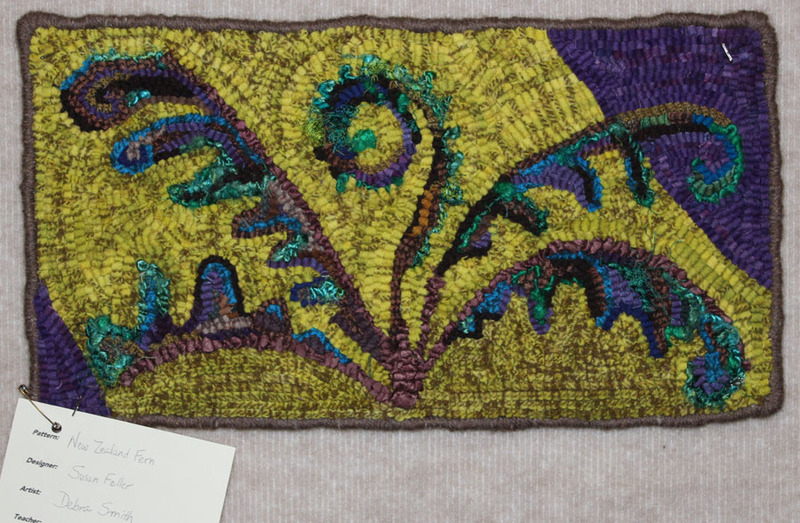 Always, there is some little rug that speaks loudly to me; this year it was Deb Smith’s version of ‘New Zealand Fern’, design by Susan Feller. They did take a side trip together to New Zealand on their way to the TIGHR conference in Oz last year. the colours are what make my heart sing… and that bit of shine in the torquoise! Marsha Shepherd is the artistic director of the Cambria Pines Rug Show and I find that usually the North wall of the ball room is special! 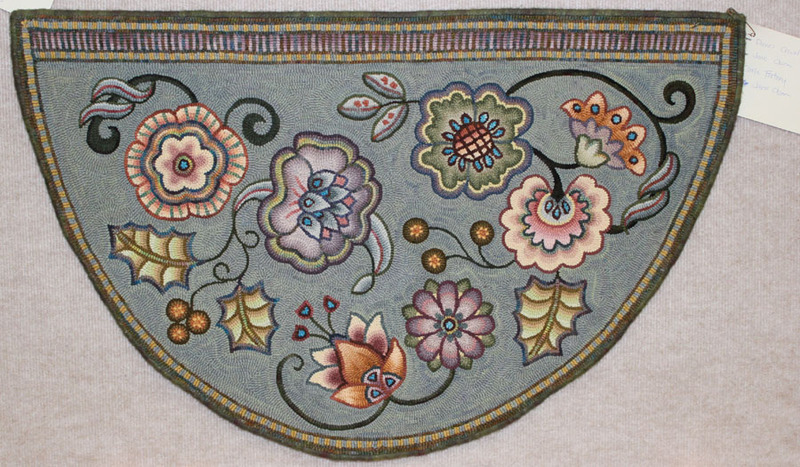 I am thrilled to be included in this special wall with my ‘Rose Eye Crow’ and ‘A Dozen Roses’ design by Fritz Mitnick, taught at Western Teachers’ Workshop by Kathy Stephens, and hooked by yours truly. It was very fun having Donna Hrkman in California; she also taught at Cambria Pines Rug Camp and brought many of her spectacular rugs! 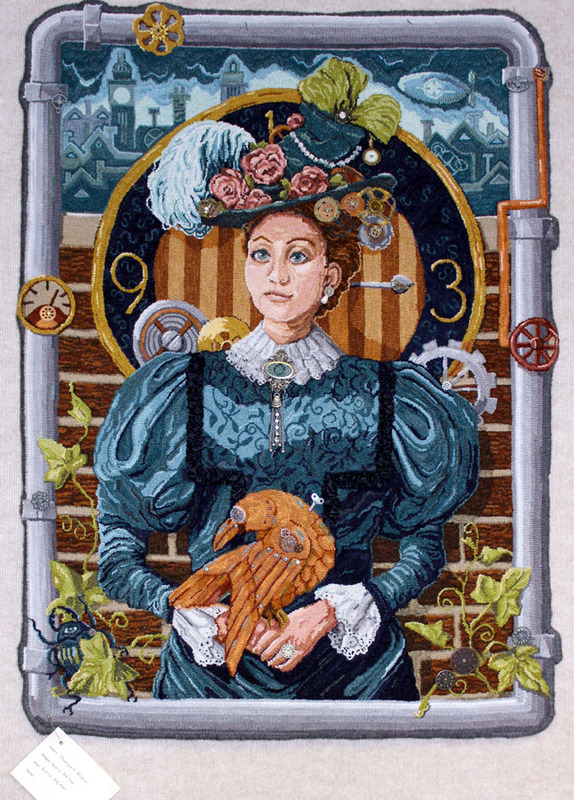 This is her latest; ‘Steampunk Reverie’! It not only has hooked metal parts on it, but actual metal parts sewn on too! Donna designed a special steampunk design for Deb Smith, which Deb was hooking quite well at camp. There were lots of exciting projects in Donna’s class, including lots of beautiful pets. 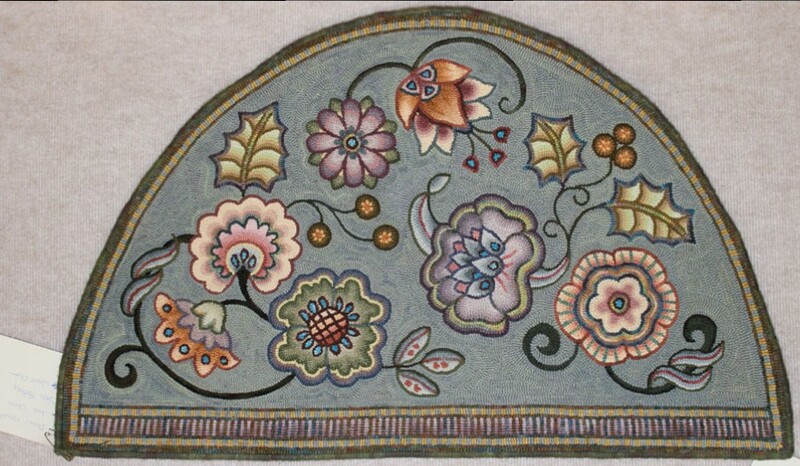 We’ll probably see them in next year’s rug show! Finally a little gem hooked by Carla Fortney, ‘Diane’s Crewel’. The designer and teacher was Jane Olson, a lovely tribute by Carla. And right side up! A wonderful review, I would tour any gallery with you. Color and their reactions abounds. Hi Laura! Wonderful pieces! I saw Sarah’s butterflies at Ocean City workshop in April. She does beautiful work! The leaf triptik is very interesting! All the pieces are fun! We are going to be around Petaluma, I hope, sometime early Sept. We are on a two month roadtrip starting tomorrow morning! If you are around, may try to contact you.